Health officials have ordered an investigation into concerns over care at a Powys hospital in recent years. 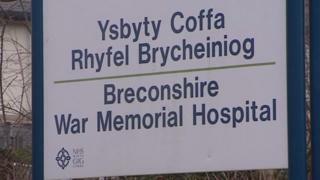 Police have also confirmed that they are looking into the same issue at Brecon War Memorial Hospital. Powys Teaching Health Board told BBC Wales it has commissioned an external inquiry into the concerns, which it said relate to care "a number of years ago". The board says it is in close contact with Dyfed-Powys Police. The force is also carrying out an "investigative assessment" into patient care issues between 2010 and 2012. Brecon War Memorial is one of nine community hospitals in the county. It has 30 beds and almost all are currently occupied. The hospital also has a minor injury unit, birth centre, day surgery theatre, assessment unit, children's centre, X-ray, dental suite and other services.